The Kansas Healthy Food Initiative (KHFI) is a public-private partnership that aims to increase access to affordable, healthy food to improve the health and economic development of Kansans and their communities. 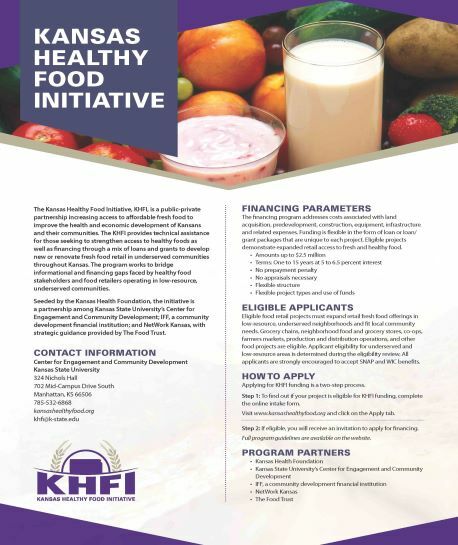 The KHFI provides technical assistance for those seeking to strengthen access to healthy foods as well as financing through a mix of loans and grants to develop new or renovate healthy food retail in underserved communities throughout Kansas. The program works to bridge informational and financing gaps faced by healthy food stakeholders and food retailers operating in low- to moderate-income areas. Seeded by the Kansas Health Foundation, the initiative is a partnership among Kansas State University’s Center for Engagement and Community Development, IFF (a community development finance institution) and NetWork Kansas, with strategic guidance provided by The Food Trust. For more information about KHFI, view the Fact Sheet (pdf).